These sweet little parcels of ground pistachios are flavoured with a delicious honey and cinnamon syrup. This baklava bites recipe is featured in Season 4, Episode 5. For the filling, put the pistachios, sugar and cinnamon in a food processor and pulse until finely chopped (don’t to over chop as it will turn into a paste). Set the mixture aside in a bowl. For the pastry, lightly dust a work surface with cornflour and cut the sheets of filo into 24 x 2in squares. Take one square, dust off any excess cornflour and brush with melted butter. Set another square on top at a 45 degree angle and apply more butter. Transfer to a 24-hole mini muffin tin, gently pressing the pastry into a hole. Repeat to fill all the holes. Fill each pastry case with the filling, but don’t compress the mixture as this will prevent the syrup being absorbed properly later. Bake for about 14 minutes, or until the pastry is crisp and golden-brown. Meanwhile, make the syrup. Add the honey, sugar, lime zest, cinnamon and 55ml (2fl oz) water to a small saucepan set over a medium heat. Bring to the boil then simmer until the syrup is thick enough to coat the back of a spoon (about 15 minutes). Remove from the heat and carefully strain the syrup (boiling sugar is very hot, so take care not to burn yourself) and immediately pour it over the hot baklava bites as they come out of the oven. 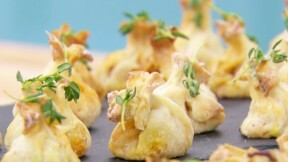 For the decoration, place strips of lime zest and a pistachio on each baklava bite. Serve warm or cold. For this recipe you will need a canelle knife and a 24-hole mini muffin tin. Note: This recipe contains U.K. measurements and may require conversions to U.S. measurements. It has also not been professionally tested.